WAAR is the World Association of Adult Recreation. Let WAAR help you organize your Sport or League! Turkey, Turkey, Turkey!!!! WAAR is setting up Co-ed Bowling leagues in your area! Come out and play on a 6 person team with your best friends. The leagues are co-ed and sure to be a perfect fit to replace those dull nights at home! COMING SOON! Currently WAAR is looking to set up beach Flag Football Leagues at the oceanfront for the spring/summer season(s). If you have any suggestions or want to help us get things started, please contact us today! He shoots!.... He scores!!!! Goooooooaaaaaaaallllllllllll!!!! Currently WAAR is looking to set up leagues in Hampton Roads for 2010. If you have any suggestions or want to help us get things started, please contact us today! Get in on the ground floor and help create an awesome league! If you can dodge a wrench..... come play WAAR Dodgeball! Everyone is Dodging, Dipping, Diving, Ducking and.... Dodging to come out and play WAAR Dodgeball. 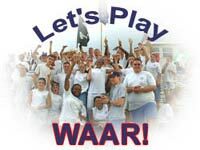 Currently we play in the Summer in VA Beach but WAAR is looking to establish more leagues in your area. Contact us and let us know where we can play. Tennis courts work best! Ya, that was your disc slamming straight into a tree! Come try out your skills at our newest WAAR sport... Disc Golf. It's a laid back stroll through our local area disc golf courses with your friends and then some socializing at the Sponsor Bar afterwards. In other words... it's a blast! WAAR League, Sport, Event or Class in your area? WAAR was started to help adult sports leagues across the world become organized. Sports include Kickball, Dodgeball, Softball, Flag Football... and many more! WAAR is looking to create and promote new sports and leagues and reorganize existing leagues across the United States. Get united under one umbrella... let WAAR help. Allow WAAR to setup and manage your league or event! The goal of WAAR is to provide you with the best possible experience for your sport! Give us a try and have the time of your life! It's the most fun you can have with your clothes on!